I live near a public football (soccer) field and during the spring and summer months, it is a magnet for the local school kids. They sit on the grass in their uniforms and eat chocolate bars and drink soft drinks. Then they leave their wrappers and plastic bottles on the ground for us older and more responsible citizens to pick up and throw away. Occasionally there are love birds who snuggle up under the trees in a corner of the field. Last year there was a couple who brought their own blanket, not to sit on, but to cover themselves. Many times I tried to avert my eyes but still ended up watching them with both amazement and repulsion. Once while walking dogs with Diana we saw them and simultaneously I said, “That’s disgusting” while Diana said, “How marvelous.” Then I felt all puritanical and up-tight. Today while walking Pickles, I saw this couple making out right in the middle of the playing field. 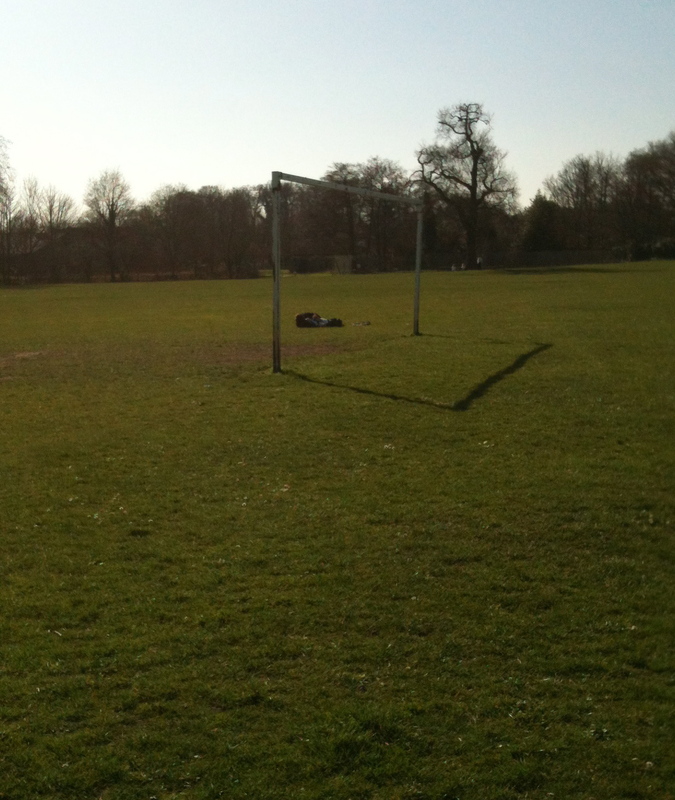 That dark spot is them, making out near the goal post. I think the older you get, and the further away from the age of passion, the more puritanical you get. Yes, I think Alan has a point! I squirm at some things, but still smile at others.